Arisugawa-no-Miya Memorial Park (有栖川宮記念公園), originally the urban villa of feudal lord Minonokami Nambu, is now a tranquil park located within central Tokyo. 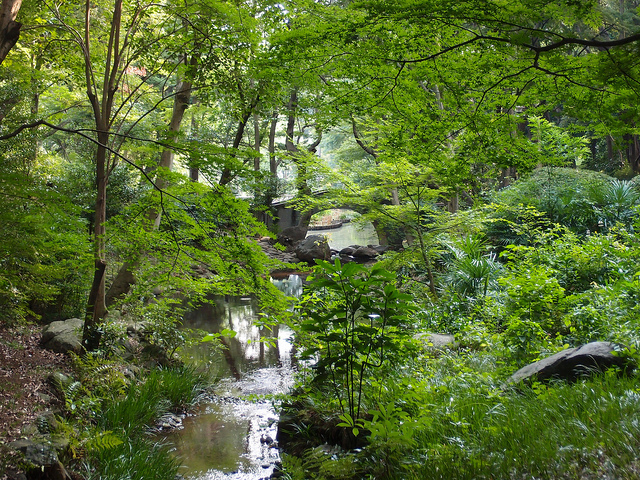 Surrounded by foreign embassies, and located behind Hiroo station, the park provides a wide variety of natural scenery, with a lake, waterfalls, ponds and bridges. A host of wild birds, along with the park’s large amount of trees, drowns out the sound of the city. Fishing in the lake is allowed, and bicycling parking is provided within the gate.